Webinars are 60 minute sessions that allow you to learn the latest from the best in the field. Each session qualifies for 1 point toward CFRE education requirements. AFP webinars are a great professional development opportunity and they are free for members! Guests pay $15. You can pay your guest fee online:pay now. 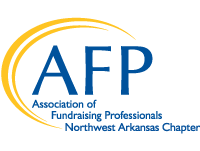 Registration for AFP events or meetings is non-refundable. Unless otherwise noted, all conferences begin at 12:00 noon and end at 1:00pm. Please RSVP for audio conferences to Sarah Du Preez. For a detailed listing of program and presenter descriptions - click here.